We women have this lovely thing we have to deal with once a month. I’ve told you about how I take advantage of my period for liver cleansing, but what about period pain? Is it normal? How can we deal with it naturally? 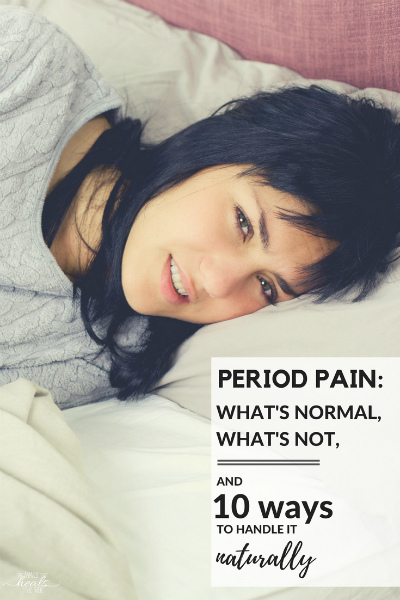 Because it’s a common occurrence we get used to dealing with from a young age until eternity (ok, it feels like it), we become desensitized to period pain. 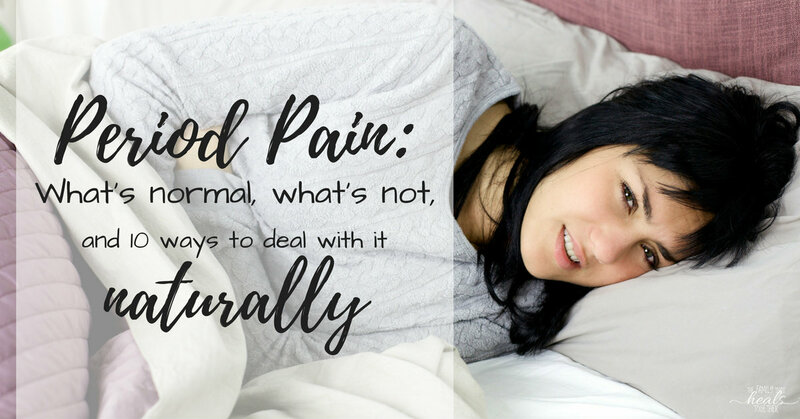 Pain can range from mild cramps to full on body aches, but whatever you may be dealing with, have you stopped to ask: is this even normal? The average period includes mild cramping, fatigue, and crankiness, and lasts around 5 days. Because menstruation involves cleansing the uterus, the uterus must contract to eliminate unneeded nutrients that have accumulated in preparation for a baby. This is normal. Most women lose a total of about 30-40 ml of blood during their cycle, or about 6-8 tsp. More than 60 ml, or 12 tsp, is considered excessive and may be cause for concern. inability to function in a normal capacity. Many of the hormone balancing tips below may help, but if your period makes your life miserable for a week out of every month (and odds are, if your period is bad, the week before your period includes bad PMS symptoms as well), it may be time to seek out a naturopath or other naturally-minded practitioner to help you get to the bottom of your painful period. Clary sage is helpful when it comes to hormones. It helps to balance estrogen levels because it contains natural phytoestrogens, which in turn can help relieve discomfort during your cycle. Additionally, clary sage is anti-spasmodic, making it the perfect solution for relieving cramps. I rub a few drops over my ovary where I’m feeling cramping pain as often as needed, though I typically only have to use it one or twice before cramps are relieved. Get clary sage essential oil here. Organic coconut milk powder- coconut contains the perfect balance of essential fatty acids as well as saturated fat, the building blocks of healthy hormones. You’ll also find electrolytes in coconut milk, which will help to replace fluids lost during your cycle, ease cramping, and restore energy levels. Grassfed hydrolyzed gelatin- gelatin is one of my favorite food-based supplements, and for good reason. It’s packed full of amino acids, which help to balance hormones, and, in turn, neurotransmitters (aka those little things that control your mood- hello PMS!). The easily-assimilated protein and other nutrients in gelatin are perfect for replacing nutrients lost during menstruation. Organic blackstrap molasses- molasses is rich in minerals, especially iron, one of the main nutrients lost during your cycle. Anytime you lose blood, you are at risk for becoming anemic. A healthy, balanced diet should prevent anemia, but molasses is a great assurance that you do not lack iron during your period. I don’t know if there’s anything more comforting than applying heat to my abdomen when it’s feeling all crampy. And there’s nothing less invasive, either. You can try this heating pad, or make your own rice sock. Fill the sock with the rice (combine with lavender flowers, if using) and tie a knot in the end. Heat for 30 seconds-minute in the microwave, then place on abdomen as needed. Make sure you store it in a dry place so that moisture doesn’t ruin the rice. I was first introduced to red raspberry leaf when I was preparing for my first homebirth (with our third son). My midwife suggested it in the weeks leading up to labor in order to prepare my body for an easier labor. I religiously drank red raspberry leaf tea several times a day towards the end of that pregnancy, and it was, indeed, my easiest labor. Red raspberry leaf eases period pain for the same reason it eases labor: it contains a constituent called fragrine, a very potent alkaloid which helps to tone the uterus. Additionally, red raspberry leaf is a rich source of vital minerals needed during menstruation. Red Raspberry Leaf Tea is full of a naturally occurring calcium that is easily absorbed by the body. In the smooth muscle of the uterus, calcium controls the depolarization of the cells. That in turn, allows the uterine muscle to receive oxygen and work efficiently. In other words, without a sufficient supply of calcium, only part of the uterine muscle will work as it should. This will strain the rest of the uterine muscle beyond reason, generating heat and stress on an already taxed body. To make a tea from red raspberry leaf (which I suggest doing 1-3 times per day during menstruation), place one-two teaspoons loose red raspberry leaf in a tea cup and pour boiling water over it. Allow it to steep for about 10 minutes before filtering and drinking. Buy it in bulk for making tea here. A toxic liver can result in unpleasant menstrual and pre-menstrual symptoms. Your body naturally detoxifies during your period, and that includes your liver. Menstruation signals your body to dump unneeded nutrients, as well as waste during this time, so if your liver is over-taxed and bogged down with toxins, you’re more likely to have a painful period as your body struggles to cleanse. Hormone disruptors, also known as endocrine distruptors, disrupt normal hormone production in the body, either by causing over creation of certain hormones, or restricting needed hormone production. This is why I don’t use plastics or canned foods in my kitchen or harmful chemical cleaners or personal care products. We also avoid flame retardents by buying our kids cotton pajamas and being mindful about the furniture we purchase. Additionally, we buy as much organic produce as we can. Not only is magnesium needed to help your body absorb calcium, but it’s got lots of great medicinal properties on its own. Magnesium is most well-known for its ability to soothe and relax muscles, which can be particularly helpful for easing painful cramping. taking dehydrated liver capsules (the easy way to eat liver if you don’t like it!) Learn how to make them yourself here, or buy them here. Cod liver oil is a good source of hormone balancing omega fatty acids, as well as vitamins A, K, and D. Vitamin A is needed for balanced estrogen and normal menstrual bleeding and vitamin K helps blood clot, which can prevent excessive bleeding. Because of the nutrients found in cod liver oil, it has been purported to help with heavy bleeding and abnormal menstruation. You may need to work with a practitioner or play around with the dose, but it’s been reported that high doses of cod liver oil can correct menstrual problems due to the high content and bioavailability of vitamins. Extra virgin cod liver oil is the only one I trust. Get it here. Finally, and most importantly: take care of yourself. Avoid processed foods and focus on good fats for hormone balance, good proteins for iron, and plenty of fresh, organic produce for vitamins and minerals. Steer clear of sugar and processed grains that will increase the burden on your liver and detox mechanisms. Make sure to sleep at least 8 hours a night, and take a rest during the day if you’re able and feel the need to. Honor your body’s needs while it performs the tasks it was created to and don’t push yourself to accomplish more than you’re physically able. Your period should be a time to relax. What do you do to ease period pain? 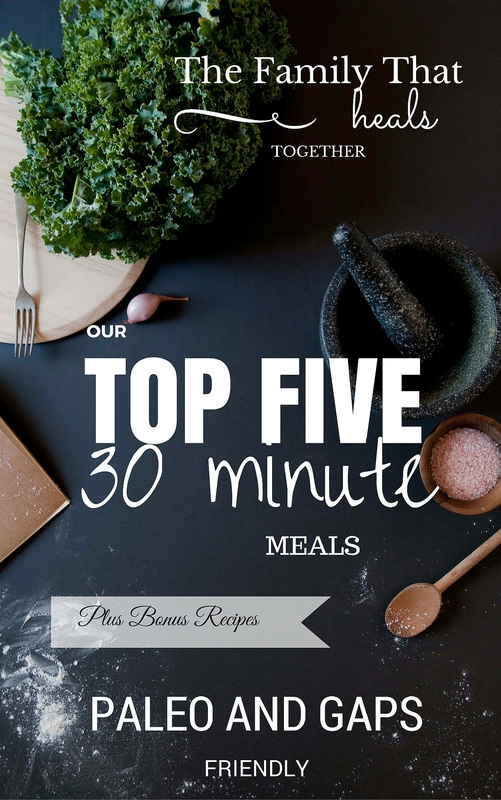 Be sure to share this using one of our links so your mama friends can use these tips too!